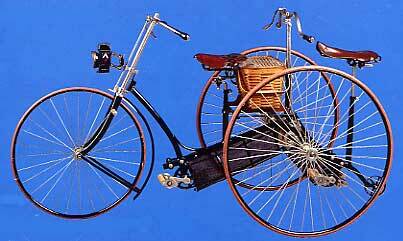 This superb 1889 Rudge adult tandem tricycle sold for $17,000. Notice the tiny steel wheelie wheel just behind the rear seat tube and the coasting pegs on the fork. And, how bout that handy wicker basket; picnic anyone? April 5, the day before the Schwinn-family bicycle collection auction, I met Jerry Rodman. We bumped into each other at the exhibition where you get a chance to study the stuff up close. The gallery is in downtown Chicago, not far from where Schwinns were built for almost a hundred years. I spent three hours sorting through turn-of-the-century bicycle catalogs, gawking at display cases full of nameplates ("head badges"), handling bicycle miniatures, thumbing through libraries full of long-out-of-print cycling titles, and drooling over the 150 spectacular bicycles to be auctioned. Rodman was just standing there, looking melancholy. I introduced myself and he pointed at a large steamer trunk covered with Schwinn labels amidst the pre-auto two-wheelers. They shouldnt be selling my trunk, he said. Then with the recall of a nine-year-old he told me about racing six-days for Schwinn. It was during the 1930s, the heyday of the race game, when cycling was to American sport what baseball is today. Six-day races are just that, grueling marathons held on a track, crowds sometimes swelling to 25,000 at the height of the action. Good thing. Because the next day, only millionaires could compete in the bidding. 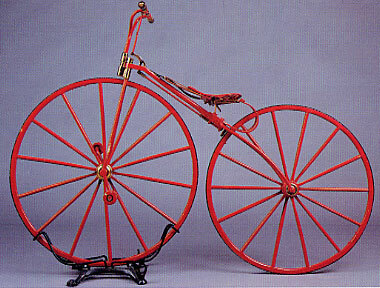 Historically meaningless bikes went for hundreds and damaged or incorrectly equipped models were snatched up as if they were prime goods simply because of the Schwinn connection. Meanwhile, really desirable models sold for twice what they usually bring at auctions and swap meets. Take the 1968 Sting-Ray Orange Krate, the one-millionth to roll off Schwinns assembly line, that sold for $16,100; the 1960 Bowden Spacelander that fetched $19,500, and the money-maker of the day, a 1869 Dexter boneshaker made in Poughkeepsie, New York, that netted $24,150. they shake your fillings loose and slide in corners. Rumor amongst the standing-room-only crowd had it that the big bidders were Jay Leno and Clint Eastwood. But Assistant Director Valeri Vanourek dismissed the buzz, explaining that the money man was James Dicke, an Ohio collector who opened the wonderful Bicycle Museum of America with his booty. The bikes raised $700,000, twice what Leslie Hindman, who owns the auction house, expected. mostly of wood. 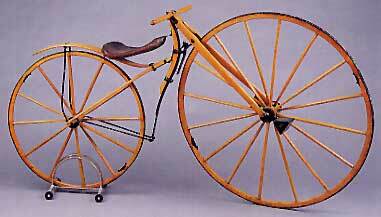 Note the triangular pedals.